There are sometimes where I get in the mood for a good drama/women’s fiction book. Doesn’t happen a lot because I haven’t had the best time reading those genres. It is hard for me to get into drama/women’s fiction. No particular reason, I sometimes have an issue with my attention being kept. 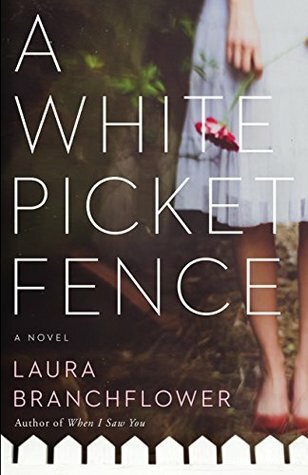 So I did go into reading A White Picket Fence not expecting to like it. I enjoyed reading it. Again, a book that I shouldn’t have judged based on its genre. You would think that I would know better by now….lol. The plot of A White Picket Fence was pretty straightforward, even if it did take some twists and turns as I read it. Lina has been married Phil, her high school sweetheart, for 25 years. They have had a very rough year but things were looking up. Lina’s world imploded when Phil confesses that not only did he have an affair but he got the woman pregnant. Lina learns that she needs to find herself after 25 years of marriage. She also needs to heal from a traumatic event that happened to her and her sister when they were teenagers. But, she also needs to figure out if Phil can ever be forgiven and if their marriage can be salvaged. While that plotline is going on, Lina and Phil’s daughter Katie is coming into her own. Katie had been very depressed and resorted to cutting to deal with her feelings. She had been on medication and seeing a child psychiatrist to help her work through her issues. Katie meets Matt, a man 2 years older than her, who calls to her in a way that no one has ever called to her before. But will Katie ever overcome her problems and be with Matt? You need to read the book to find out. I thought Lina was a bit of a doormat at the beginning of the book. I mean, I would have confronted my SO if a strange woman was texting and calling him after work hours. Instead, she sat on her feelings. Instead of talking to Phil, she talked about what happened to her best friend and her sister. But her doormat status changed in my eyes. She was strong enough to throw Phil out after finding out about the other woman and the baby. She was strong enough to start healing from the traumatic event that she and her sister had years before. She was also strong enough to do something that I would never do. But, at the same time, she wasn’t strong. If that makes sense. She was attracted to her daughter’s child psychiatrist. She attempted to start a relationship with him. Which is unethical on his part. Anyways, she couldn’t choose between the psychiatrist and Phil. It made her realistic in my eyes. As was her reactions to everything that happened in the book. I thought Phil was a jerk. A huge jerk. I didn’t like him. He came across, to me, as very condescending and very controlling of her. She tried to move on and he flipped out. Turned the tables on her when he cheated. When he got another woman pregnant. When I read that part, I did an eye roll. What did he expect? But Phil did start to change as the book progressed. His change was very minor at first and became more noticeable as the book wore on. The only thing that he didn’t lose was his elitist judgey Mcjudgerson views on life. Like how he treated Matt. He judged him on tattoos and jumped to the worse conclusions about him. He did learn to like him. By the end of the book, he did change for the better. It didn’t make me like him any better. Like I said above, I am not a fan of drama/women’s fiction. But I have come across books that make me rethink my stance. A White Picket Fence is one of those books. For a book to make me rethink my stance, it has to do 2 things. It has to get me completely immersed in the book, to the point where I mourn the ending. It also has to make me have very strong feelings for the main characters. A White Picket Fence does that and then some. The only complaint that I have about the book is the whole Lina/Shiloh traumatic event. I wish that it had been revealed sooner. Because once it was revealed, I understood Phil and Lina’s relationship a lot better. I was not expecting what happened at the end of the book to happen. I was expecting something else and I was a little mad about it. But this story is about the power of forgiveness so I can understand why the author went in that direction. Doesn’t mean that I was happy about it!! In conclusion, I enjoyed reading A White Picket Fence. It was a well-written family drama that will pull on your heartstrings. The characters were fleshed out. The plot (along with the sub-plotlines) were very well written.